Baking soda works well in a pinch for deodorizing rooms. In a spray bottle, combine 2 teaspoons of baking soda in 2 cups of water, shake well and spray the air in the room to help neutralize odors. Baking Soda works amazingly well as an antacid. Simply mix a teaspoon of baking soda in a glass of water and slowly drink it down. Granted, it may not the best tasting concoction in the world, but it works amazingly well and quickly. You should only use this in emergencies however. Prolonged consumption may not be safe. To relieve the itchiness and discomfort of Athletes Foot, make a paste of water and baking soda and apply the past to the infected areas, including in between your toes. Let it sit for about 5 minutes, then wash clean. Baking soda mixed with a little water makes a great cleaner for plastic or porcelain tubs, shower and sinks. Baking soda will both help draw out the venom and neutralize the sting caused by bees or wasps. Be sure to remove the stinger first, then make a paste of baking soda and water. Apply to stung area, then cover with a band aid. Make a paste of Arm & Hammer baking soda mixed with a little bit of water and apply it directly to the stain. Let it sit until it drys, then brush it off and launder item as usual. Baking soda can help relieve the pain of minor burns. Make a thick paste of some baking soda mixed with water, apply to the burn, then cover with a very damp gauze pad for about 10 minutes. To help deodorize a cat litter box, cover the bottom of the box with about a quarter inch of the baking powder before pouring the clean litter on top. Each time your cat scratches, it will keep reactivating the deodorizing properties of the baking soda. To relieve the itchiness of chicken pox, add a cup of baking soda to a warm bath and soak for at least 20 minutes. Baking Soda is a great way to keep your coffee maker clean from the inside out. Take out any filters and fill the carafe with one cup of lukewarm water. Add ¼ cup of baking soda to the water in the carafe and swish it around until all of the baking soda is dissolved. Pour the water into the reserve tank – place the carafe back in its spot and run your coffee maker through a regular cycle. Chances are the water that comes back through will be slightly brown. Repeat the process – this time using just plain water – run through a regular cycle again – then wash the carafe. Applying baking soda to a cold sore can not only help alleviate discomfort but can actually help heal the sore faster because it neutralizes the bacteria. You can either dip a moistened finger into the baking soda and apply directly to the sore (be sure to wash hands afterwards) or mix one teaspoon of baking soda in a glass of water and rinse your mouth with the solution. Arm & Hammer can not only help whiten dentures, but also help deodorize them as well. Wet a toothbrush, and coat it well with the baking soda. Then simply scrub the dentures and rinse. To deodorize diaper pails you can sprinkle a little baking soda in the bottom of the pail or in the bottom of the bag you use in the pail. For cloth diapers themselves, mix a half cup of baking soda in two quarts of warm water, let diapers soak in the solution for about a half hour, then launder diapers as usual. Add two to four tablespoons of baking soda to your baby’s bathwater to help relieve diaper rash while giving your little one a bath. Baking soda will not only help keep your drains clean but will help deodorize them as well. About once a week pour about 4 tablespoons of baking soda down each drain and follow up by flushing with very hot water for a few minutes. Arm & Hammer Baking Soda makes for a great dry shampoo. Simply sprinkle some of the soda on your hair and work it in very well. Wait about fifteen minutes, then brush it out of hair. It will absorb the excess oil from your hair. To whiten fingernails and toenails, add about 3 tablespoons of baking soda to one half cup of water in a bowl. Soak nails in the solution for about 15 minutes. Then gently brush nails with a nail brush. Arm & Hammer Baking Soda can actually soothe aching feet. Add three tablespoons of the soda to a basin filled with warm water and soak feet for at least 15 minutes to relieve achiness. Soaking your feet twice a week in a baking soda solution will inhibit odors because it raises the acid level of your feet. Dissolve 2 tablespoons of soda in a gallon of warm water and soak your feet for at least 15 minutes at a clip. Flowers will actually stay fresher longer if you add a teaspoon of baking soda to the water in the vase. Sprinkle your pots and pans with some Arm & Hammer baking soda, add a little water and scrub. Easily removes the grease and stuck on food. An easy way to clean hairbrushes or combs is to combine four tablespoons of baking soda in a tall glass of warm water then soak the brushes and combs for about a half hour. When done, rinse them clean. Baking soda is great for removing hand odors. Simply rub hands with baking soda mixed with a little bit of water. Not only can baking soda eliminate the sting of bees or wasps (as mentioned above) but it can also relieve itching from the bites of other insects such as mosquitoes. Simply make a paste of some baking soda and water, apply it to the bite, and let it dry. Anyone who has ever been stung by a jelly fish knows how painful it can be. A paste made of baking soda and water can help relieve that sting almost immediately! Simply apply the paste to the stung area and let dry. Here is a neat trick for deodorizing smelly clothes. Simply sprinkle some baking soda over each layer of dirty or stinky clothes as they are added to your laundry basket. Then when you wash them, the baking soda will continue to do its job of removing odors and leave clothes feeling soft. Strangely enough, a little baking soda can actually deodorize your pets and have them smelling fresh. Simply sprinkle some baking soda onto their coats, rub it in gently, then brush it off. It makes a great dry shampoo. Relive the itch of poison ivy by applying a paste made of water and baking soda. Apply to the itchy areas and let dry. In a gallon of water, add one-third cup of baking soda. Mix well, then dip a washcloth in the solution, wring it out and apply it as a compress to the affected areas. To relieve the itching of a rash, fill a tub with warm water and add about one half cup of baking soda to the water and soak for about 20 minutes. For smaller rash areas, make a paste of baking soda and water, apply the paste to the rash and let it dry. You can use baking soda for razor burn by mixing one teaspoon of baking soda in one glass of water and applying to the shaved area. Place an open box of Arm & Hammer Baking Soda in your refrigerator to help combat and neutralize food odors. Sprinkle a little baking soda into sneakers, shoes, slippers, boots or socks that need deodorizing. Dissolving one tablespoon of baking soda in a glass of water and sipping slowly throughout the day, can actually relive the pain of a sore throat. Baking soda can also help relieve the pain and possible itching caused by a sunburn. Fill a tub with tepid water and dissolve about one half cup of baking soda in it. Soak for about 20 minutes, then let the powered solution dry on your body. Have a special occasion coming up or your teeth need a little whitening? Try some baking soda. Simply dampen your toothbrush, press the brush into the baking soda and brush your teeth for at least two minutes. Then rinse and spit out. Please Note: This remedy should only be used for special occasions. Prolonged use of brushing your teeth with baking soda can actually begin to wear away enamel on teeth. Simply pour a cup of baking soda into your toilet bowl, let it sit for about an hour – then flush. It helps both clean the bowl and absorb odor. 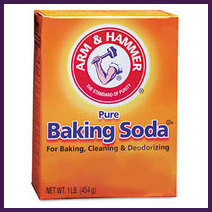 Baking soda also makes a great under arm deodorant in a pinch. Simply apply some dry powder under arms with a powder puff or put the baking soda on a damp rag and rub it under arms to prevent odor all day. Arm & Hammer Baking Soda can actually help treat urinary tract infections. Mix one teaspoon of baking soda in a glass of water and drink it once a day for two or three days. Again this is not a solution that should be used too often however. Be sure to read the box for safety precautions. Baking Soda does a great job of deodorizing urine smells from mattresses, carpets, furniture and other areas. It works especially well when used with club soda. Blot up as much of the urine as possible, then pour some club soda over the stain. Immediately reblot the area to get as much of the moisture up as possible, then let area dry completely. When it is dry, liberally sprinkle the entire stained area with baking soda and let it sit for at least an hour. Then vacuum it up. Add a little baking soda to your vacuum bag or sprinkle a little on a rug and vacuum up to help deodorize your vacuum cleaner and neutralize any stale odors that emanate from it while in use. Arm & Hammer Baking Soda can help remove any remaining odor caused by vomit stains on carpets or clothes. After cleaning the area as best as you can, follow up by liberally covering it with baking soda. Let it sit for at least an hour, then vacuum it up. Baking soda can actually help repel water from your windshield. Simply sprinkle some baking soda on a damp cloth, wash down windshield and rinse. This entry was posted on Thursday, May 24th, 2012 at 2:16 pm	and is filed under Baking Soda. You can follow any responses to this entry through the RSS 2.0 feed. You can leave a response, or trackback from your own site.